Fixtures with a black finish, often mixed with other colors and metals, are becoming increasingly popular with homeowners. Lighting is one of the most impactful elements in home décor. When it's time for an update, many homeowners find they can make the biggest impact by replacing all of their old, outdated lighting. That’s great advice for those who can simply replace all of their existing fixtures with new ones. But what if you don’t want to replace all of your fixtures and worry that bringing in one or two new ones will create a disjointed, incongruous style? Solution: Simply introduce a fixture that is black or partially black with other elements that match your existing fixture family. Visit an ALA-member showroom to learn more about the lighting trends. 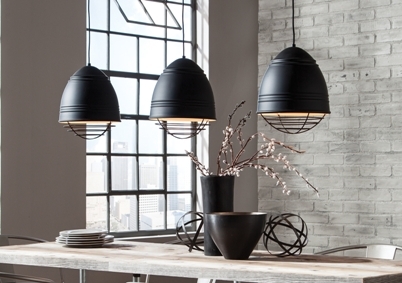 A new ALA-Better Homes & Gardens video features Jeff Dross of Kichler Lighting as he discusses the popular trend of using black in fixture designs. 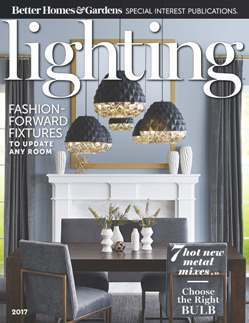 You may pick up a complimentary copy of Lighting magazine at an ALA-member showroom or view it online. Pick up your free copy of Lighting magazine at an ALA-member store. We are doing a new build with an open concept. From the front entrance, seven light fixtures will be visible. Should they all match? - Lyndsay B. 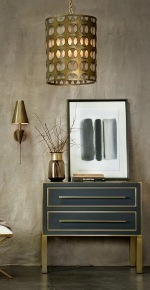 When in doubt, or for more ideas and guidance, consult with a lighting expert at an ALA-member showroom. ALA's new 2017 lighting trends video features Better Homes & Gardens lighting expert Samantha Hart discussing current lighting trends. Still have questions about lighting your home? Click here to ask an expert via email.